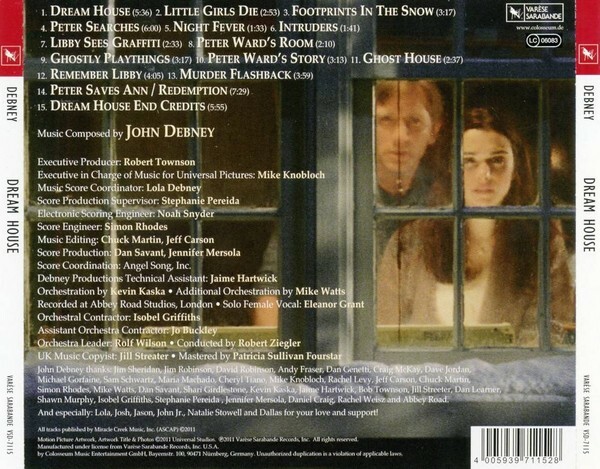 Ever since I first heard the opening music for HOCUS POCUS I knew that I would be a fan of John Debney. He has the ability to create wonderful atmospheres and to invent auras within his music, enhancing wonderfully the numerous motion pictures that he has worked upon with his original and eclectic style. That is why it is so easy to appreciate and to also like his music; the composer always produces a work or a piece of music that holds something for everyone and every taste. 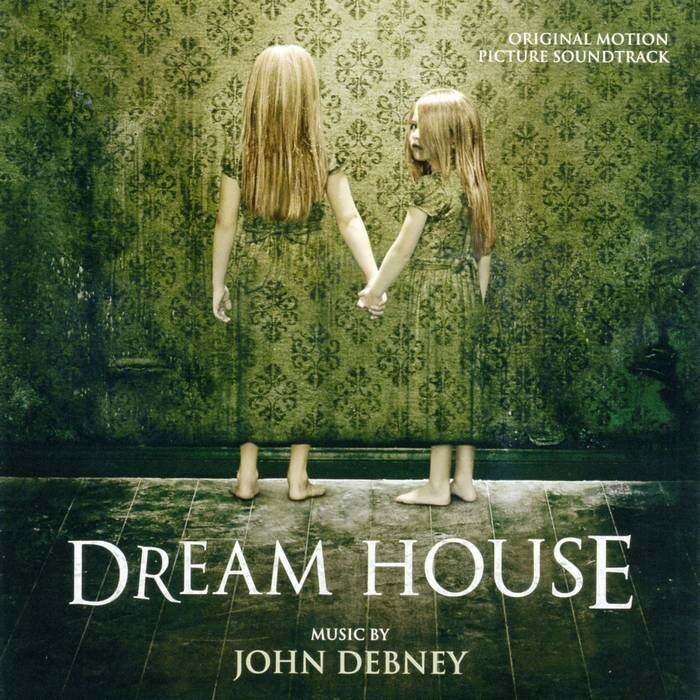 DREAM HOUSE is a horror tale and “yes” the composer does lay down some pretty fearsome music within this score that chills and purveys a feeling of uneasiness. But there is also a romantic sound present within the work and also an emotion to the soundtrack that is poignant and haunting rather than fearful and frightening. The opening track ‘Dream House’ is a luxurious and blossoming composition that is touching and heartrending. It begins with a childlike sounding solo voice, which itself immediately creates an atmosphere of unease. As the composition moves on, the composer employs woodwind, piano, and strings which combine to bring us a rather touchingly delicate lullaby of sorts - in fact one would think that everything in the dream house is just that, dreamy and at peace. The string section take on the theme mid-way through the composition adds a sumptuous and rich layer to the piece. The theme that is briefly encountered within the opening cue is given a fuller and even more sumptuous sound if that is at all possible within track two, LITTLE GIRLS DIE, which is a heartbreaking and highly emotive cue where Debney opens with a sorrowful sounding cello and builds upon this performance, gradually adding woods and strings until the piece literally bursts into a full working of the gorgeous and stimulating theme. Throughout the score the composer utilises and effectively re-introduces the central theme. At times this is just a fleeting appearance but one can hear it throughout in varying arrangements and also with differing orchestration. Debney has fashioned a score which is slightly disturbing as it evokes many emotions. It is a score filled with tension for the majority of its running time but is not just another horror soundtrack, which crashes and bangs its way through to its conclusion. I suppose one could say it is an intelligent and also an appealing work that has many a dark corner; at times these being almost jagged and Herrmannesque in their sound, as in Track 14, ‘Peter Saves Ann/Redemption’, which is a powerful, exciting and nerve jangling cue with its ominous and driving strings, booming percussion and fierce brass stabs but also has a tender sounding ending which returns us to the soaring and superb core theme or at least a variant of it. This in my opinion is one of the composer’s best scores to date and if, like myself, you had kind of lost faith in some Hollywood composers, then please give this score a listen and maybe, just maybe, you might think again. Successful publisher Will Atenton (Daniel Craig) quit a job in New York City to relocate his wife, Libby (Rachel Weisz), and two girls to a quaint New England town. But as they settle into their new life, they discover their perfect home was the murder scene of a mother and her children. And the entire city believes it was at the hands of the husband who survived. When Will investigates the tragedy, his only lead comes from Ann Paterson (Naomi Watts), a neighbour who was close to the family that died. As Will and Ann piece together the disturbing puzzle, they discover that the story of the last man to leave Will's dream house will be just as horrifying to the one who came next. 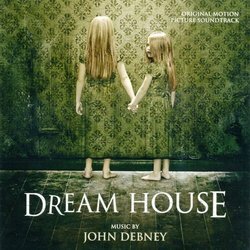 Composer John Debney (The Passion Of The Christ) conjures a haunting and powerful new score.